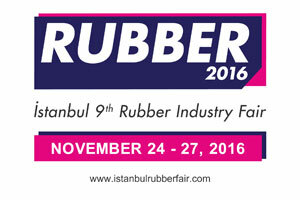 RUBBER 2016, İstanbul 9th Rubber Industry Fair will be organized by Tüyap Fairs and Exhibitions Organization Inc. in cooperation with the Rubber Association between November 24 - 27, 2016 at Tüyap Fair Convention and Congress Center, Büyükçekmece, İstanbul. RUBBER 2014 bring together the industry’s leading professionals and 194 companies and company representatives from 25 countries across a 10,000 sqm exhibition area indoor. 7.051 professional visitors were welcomed to the fair. The fair which creates new market alternatives to the industry every passing year by extending its marketing network hosts procurement committees invited by Tüyap from 4 countries including Bulgaria, Greece, Macedonia and UK. RUBBER 2016 will be held concurrently with Mining Turkey 2016, The 7th Mining, Tunneling, Machinery Equipments and Heavy Duty Vehicles Fair and Urban Expo Eurasia, Infrastructure and Landscaping for Livable Cities Fair. RUBBER 2016 will offer exhibitors opportunities to expand into new international markets, enable to showcase their latest products, technologies, and innovations; and a chance to present themselves to professional visitors from various countries around the world in a commercial platform. The scope of the fair consists of Rubber Products, Machinery, Laboratory and Raw Materials. Trade show will attract a high amount of local and global professional visitors and contribute to the development of the sector. We warmly welcome all rubber industry professionals to join RUBBER 2016.